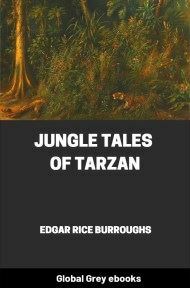 Jungle Tales of Tarzan, first published in 1919, is the sixth book of Burroughs' tales of Tarzan. 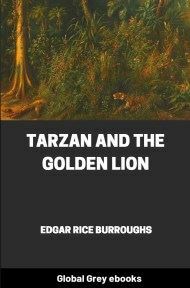 This collection of short stories explores the life of the young Tarzan, his adventurous boyhood and teen years among the great apes and other wild creatures that were his only family. TEEKA, STRETCHED AT luxurious ease in the shade of the tropical forest, presented, unquestionably, a most alluring picture of young, feminine loveliness. 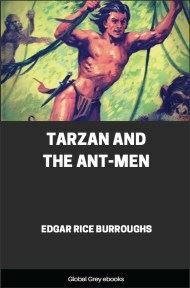 Or at least so thought Tarzan of the Apes, who squatted upon a low-swinging branch in a near-by tree and looked down upon her. You would not have guessed that in infancy he had suckled at the breast of a hideous, hairy she-ape, nor that in all his conscious past since his parents had passed away in the little cabin by the landlocked harbor at the jungle's verge, he had known no other associates than the sullen bulls and the snarling cows of the tribe of Kerchak, the great ape. Nor, could you have read the thoughts which passed through that active, healthy brain, the longings and desires and aspirations which the sight of Teeka inspired, would you have been any more inclined to give credence to the reality of the origin of the ape-man. For, from his thoughts alone, you could never have gleaned the truth—that he had been born to a gentle English lady or that his sire had been an English nobleman of time-honored lineage. Lost to Tarzan of the Apes was the truth of his origin. That he was John Clayton, Lord Greystoke, with a seat in the House of Lords, he did not know, nor, knowing, would have understood. Yes, Teeka was indeed beautiful! Of course Kala had been beautiful—one's mother is always that—but Teeka was beautiful in a way all her own, an indescribable sort of way which Tarzan was just beginning to sense in a rather vague and hazy manner. For years had Tarzan and Teeka been play-fellows, and Teeka still continued to be playful while the young bulls of her own age were rapidly becoming surly and morose. 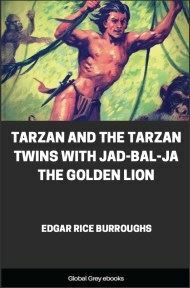 Tarzan, if he gave the matter much thought at all, probably reasoned that his growing attachment for the young female could be easily accounted for by the fact that of the former playmates she and he alone retained any desire to frolic as of old. But today, as he sat gazing upon her, he found himself noting the beauties of Teeka's form and features—something he never had done before, since none of them had aught to do with Teeka's ability to race nimbly through the lower terraces of the forest in the primitive games of tag and hide-and-go-seek which Tarzan's fertile brain evolved. 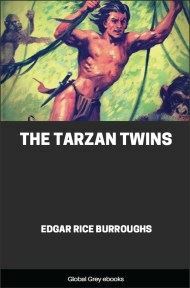 Tarzan scratched his head, running his fingers deep into the shock of black hair which framed his shapely, boyish face—he scratched his head and sighed. Teeka's new-found beauty became as suddenly his despair. He envied her the handsome coat of hair which covered her body. His own smooth, brown hide he hated with a hatred born of disgust and contempt. Years back he had harbored a hope that some day he, too, would be clothed in hair as were all his brothers and sisters; but of late he had been forced to abandon the delectable dream. Then there were Teeka's great teeth, not so large as the males, of course, but still mighty, handsome things by comparison with Tarzan's feeble white ones. And her beetling brows, and broad, flat nose, and her mouth! Tarzan had often practiced making his mouth into a little round circle and then puffing out his cheeks while he winked his eyes rapidly; but he felt that he could never do it in the same cute and irresistible way in which Teeka did it. And as he watched her that afternoon, and wondered, a young bull ape who had been lazily foraging for food beneath the damp, matted carpet of decaying vegetation at the roots of a near-by tree lumbered awkwardly in Teeka's direction. The other apes of the tribe of Kerchak moved listlessly about or lolled restfully in the midday heat of the equatorial jungle. From time to time one or another of them had passed close to Teeka, and Tarzan had been uninterested. Why was it then that his brows contracted and his muscles tensed as he saw Taug pause beside the young she and then squat down close to her? 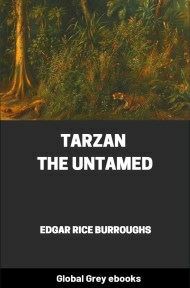 Tarzan always had liked Taug. Since childhood they had romped together. Side by side they had squatted near the water, their quick, strong fingers ready to leap forth and seize Pisah, the fish, should that wary denizen of the cool depths dart surfaceward to the lure of the insects Tarzan tossed upon the face of the pool. Together they had baited Tublat and teased Numa, the lion. Why, then, should Tarzan feel the rise of the short hairs at the nape of his neck merely because Taug sat close to Teeka? It is true that Taug was no longer the frolicsome ape of yesterday. When his snarling-muscles bared his giant fangs no one could longer imagine that Taug was in as playful a mood as when he and Tarzan had rolled upon the turf in mimic battle. The Taug of today was a huge, sullen bull ape, somber and forbidding. 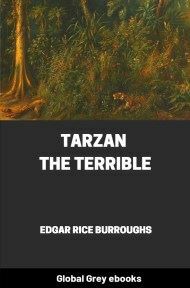 Yet he and Tarzan never had quarreled. For a few minutes the young ape-man watched Taug press closer to Teeka. He saw the rough caress of the huge paw as it stroked the sleek shoulder of the she, and then Tarzan of the Apes slipped catlike to the ground and approached the two.